BREWSTER, NY - The friendly confines of Brewster Ice Arena welcomed ARMY WEST POINT for a "home-away-from-home" matchup against Fairfield University (CT) on Sunday night. The Black Knights felt right at home, dominating the game and driving toward the team's first shutout win of the season, 4-0. Facing a highly regarded Fairfield team who entered the team 5-1-0 with several blowout wins, ARMY WEST POINT outworked, outskated, and outscored the visiting Stags. The Black Knight penalty kill unit shut down five Stage powerplays and goaltender Orion Boylston stopped every Fairfield shot. Cadet skaters added two goals in each of the first two periods, taking a commanding lead into the third period. In the third, the West Point squad locked down and used a forward-high, single-forward forecheck to keep the Stags in their end and clog the neutral zone. 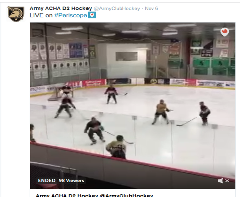 Watch a replay of the game on the team's Twitter feed (@ArmyClubHockey). Click the photo above or this link.